The Chateau has spacious, high ceiling rooms with many original preserved features. Entrance hall, reception and dining rooms and especially its gorgeous library are impressive. Slate roof, in good condition. The outbuildings are on a decent distance from the Chateau. The property is located on a short distance of villages with all amenities. Carcassonne, with its international airport is also close by. Due to its excellent location the property has an enormous potential as a B&B - hotel business or as apartment rental business. 1st floor, 330m² habitable with 7 bedrooms, ranging from 20 - 30m² each, with quite a few bath- and shower rooms. The 2nd floor, accessible via the 2 service staircases at each end of the chateau, has 14 rooms, due for renovation. The basement is on the garden level and is divided into 10 separate units, like a wine cellar, workshops, utility rooms and such. Caretakers house, on 2 levels, 220m² habitable with 5 bedrooms. Guesthouse, 80m² on ground floor level with 2 bedrooms. 1st floor is not being used. The park of 24.8 hectares, with a romantic stream and bridges, consists of 3 individual lawns bordered by trees and shrubs: the chateau is surrounded by 2 lawns, the third lawn is situated next to the outbuildings. Nice views towards fields, mostly wheat and sunflowers, and the Pyrenees. 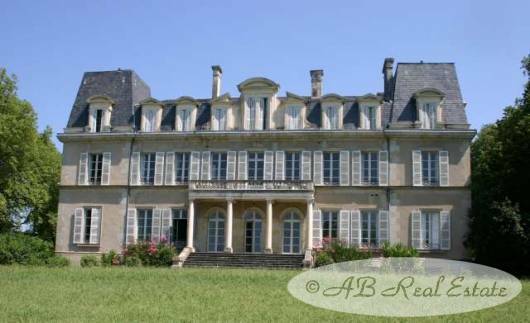 The chateau is in good general condition but in need of renovation in order to bring it to modern standards. Same for the outbuildings. It is a good think that the chateau has central heating and 7 bathrooms on ground and first floor. Beautiful property with many original features, ideal for a large family who likes to live in a grand house. Excellent location for a first class B&B, hotel or apartment rental business.